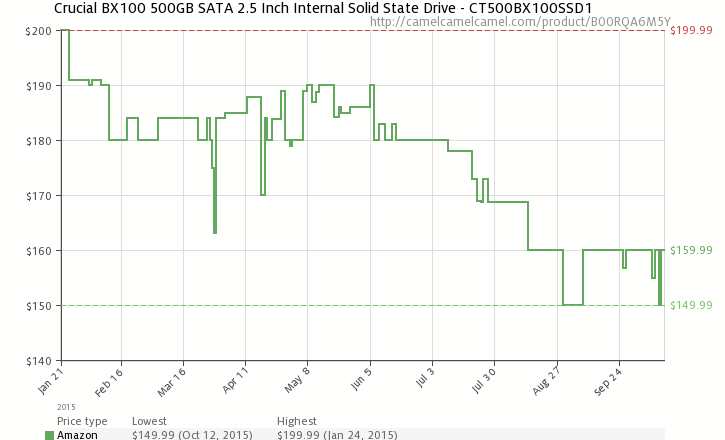 Holy cow prices on SSDs are dropping like a rock this year! I just found this deal on Slickdeals on a 500GB Crucial BX100 SSD. It's only $134.99 with free shipping. If you look on camelcamelcamel, this drive was $200 back in January. It was only about 4 months ago I picked up a 180GB Intel drive for my laptop for around $80.. but you regularly see 256GB drives for under that now. I wonder what kind of deals will show up for Black Friday this year? Maybe by next spring we will see 1TB drives for under $200?